The first HK aviation book written in Chinese. My story was to continue with the activities of the first flying tenant Colonel Harry Abbott. However, before this I must, in the interests of historical accuracy, make these observations. Quite recently I came into possession of an outline titled Kai Tak Airport in the Pre-War Era authored by a Ms. Anne Lee. On page 40 Ms. Lee observed No doubt the three books (one was my Airport of the Nine Dragons) are valuable in studying the aviation history in Hong Kong, however, they have certain weaknesses and are intellectually insufficient in explaining the beginning of Kai Tak Airport. Obviously, the authors had inadequate research and had not examined certain important archival material, such as the C.O. 129 Files. Ms. Lee mounts her contentions on plausible commonsense logic. She quotes from a document that I have never seen or even suspected existed. On the final page Ms. Lee states It will be the first HK aviation book written in Chinese. Presuming this will be the sole published language I have extracted some material from her outline. My action may hopefully benefit the English reader who values historical accuracy as sacrosanct. I paraphrase and condense some of her statements. The 1911 Revolution brought a massive influx of refugees to the British Crown Colony of Hong Kong, and the resultant housing problem attracted Wu Ting-fang, who conceived that reclamation was the answer. Singapore born Dr. Wu was the first Chinese English Barrister-at-Law and the first Chinese appointee to Hong Kong’s Legislative Council in 1880. His idea appealed to a group of Chinese merchants that included Sir Kai Ho Kai and Au Tack. 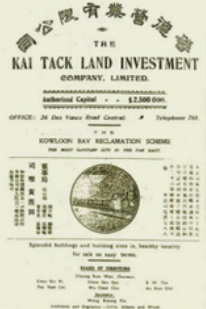 In 1914 this group formed the Kai Tack Land Investment Co. Ltd., but Sir Kai Ho Kai died soon after its formation in some financial distress. In 1916 this company started work in Kowloon Bay and the reclamation continued steadily until the strikes in the early 1920s and a recession in 1925 caused the project to fail. The reclamation dream of the Kai Tack Land Investment Company lay unfinished and vacant. Meanwhile, in 1920 Mr Au Tack had died. Ms. Lee’s contention it is impossible for them to start the project in 1924 is undoubtedly correct for both were dead. But, surely the name of Kai Tack came from the title of the Company that they had formed before their demise. Ms. Lee showed I erred by recording The Kai Tack Land Investment Company returned the reclaimed property to the Crown. She states; in 1927 the Government took over the reclamation for the sum of $HK 3,701,250 from the bankrupted land company. This seems more plausible and in character with the Hong Kong Government. Thereafter the public works completed the unfinished portion. 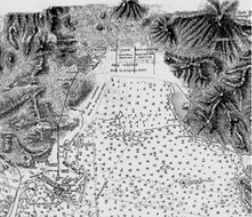 In 1925 the total aerodrome dimensions were about 60 acres, and with the completed 2nd and 3rd stages of reclamation in 1930 the area had become 205 acres of prime land. I thank Ms. Anne Lee for recording these details and wish her great success in publishing and marketing her book. However, before reverting to my story I make one final observation. The name Kai Tack Airport had a brief life for it had changed prior to the Japanese occupation. As Kai Tak Airport it became legendary but it would have achieved that fame regardless of any name. Its fame came from the thousands of forgotten people that brought its cold bloodless facades to throbbing virile life.